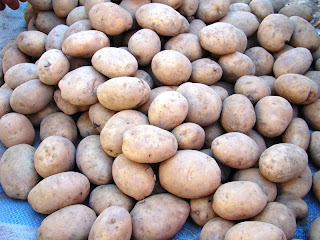 According to the website Potato2000.org potatoes are rich in several micronutrients, especially vitamin C. Eaten with its skin, a single medium-sized potato of 150 g provides nearly half the daily adult requirement (100 mg). It is a good source of vitamin B1, vitamin B3 and vitamin B6 and minerals such as potassium, phosphorus and magnesium, and contains vitamin B9 (folate), vitamin B5 (pantothenic acid) and vitamin B2 (riboflavin). Potatoes also contain dietary antioxidants and dietary fiber.